There must be something in the air. In the course of one day, I have turned into a crazy woman with lists. I prowled the house yesterday seeing things left undone for so long, so I made lists of what should be done sooner rather than later. Lists are my friends but today I'm feeling a bit overwhelmed by those I have made so I'm chopping the lists down to size. I'll make a couple of master lists to work from, divide my time up, because I'm not going to get stuck in and do everything; I'll work through the lists as it pleases me. It's not really an enormous amount of work, just tidying up, reorganisation and a bit of cleaning. I'll start today. My main focus is my knitting. I've started a shawl/scarf for myself and those cold days at work. I would love to have it finished next week, but it will take until the end of May, I think. I'm also knitting Hanno's jumper and haven't progressed much beyond the back. I promises him he would have it by June. I wonder if there are other knitters out there like myself who have a few projects on the go at once. I do that with books too, always reading a few at a time. It's quite easy with non-fiction, and that is mainly what I read, because there are no characters or plots to remember. 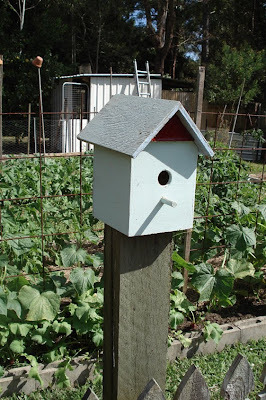 I wonder how my gardening friends are going with their new gardens. If you have the time to comment, I'd love to know. I spent quite a bit of time in our vegetable garden yesterday. I had my apron on, naturally, and wandered around with a camera in my apron pocket. 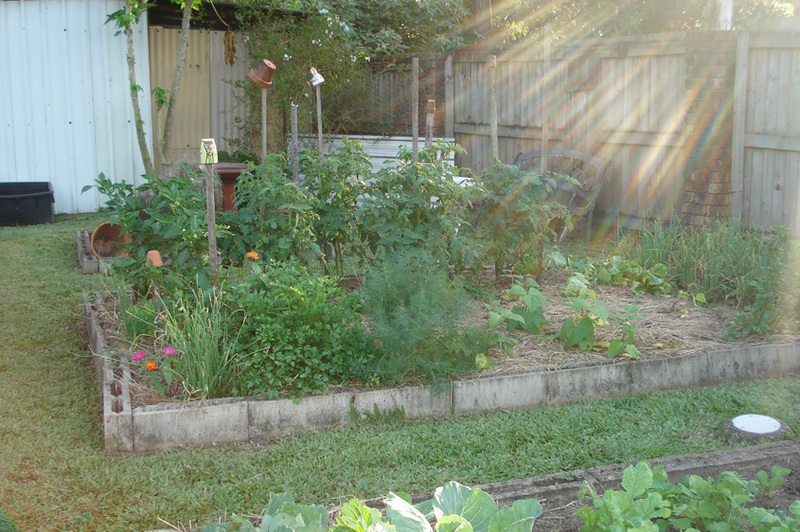 It was sunny and warm, no sound other than bird song and the gentle clucking of chooks, so while I picked vegetables for our dinner, I took these photos. 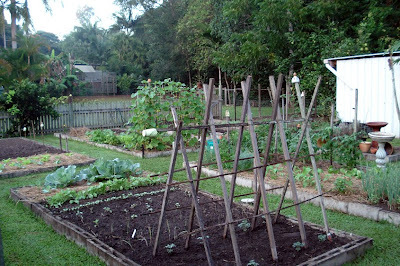 The rain has slowed the garden this year, even wiping out some of the legumes, which too much water often does, but the rest of it is looking good, a testament to that wonderful gardener I share my life with. The garlic standing like soldiers in the late afternoon sun. 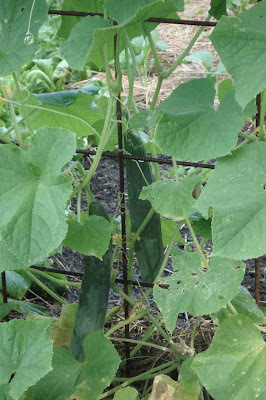 The cucumbers are almost done, although they've been sweet juicy and abundant for a couple of months. It's time to plant some more. 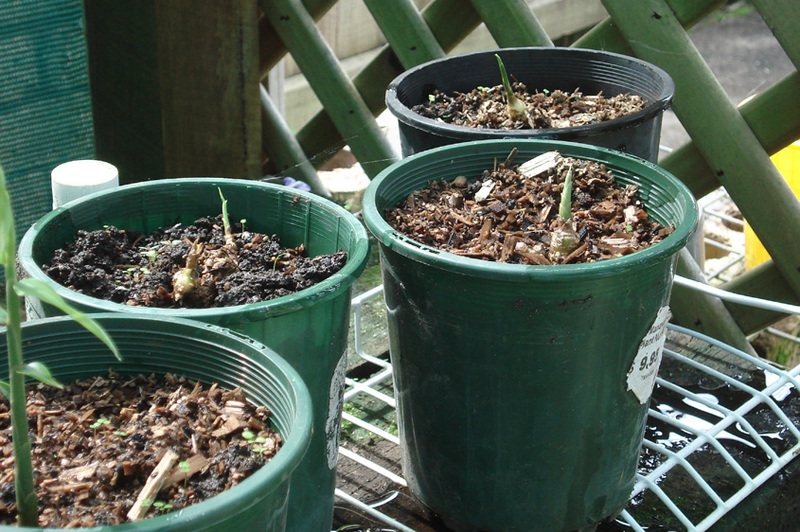 New ginger plants just starting to poke their heads up. There are new people arriving to read here every week. That always surprises me because I think everyone knows about our little community here, but still they come. To all the newcomers, welcome. I hope you find something here that helps you in some way. Make sure you read the comments every day because there are many excellent points made by the wonderful people who read here. And to everyone, I hope you are able to spend some time today in your natural environment - whatever that may be. Thankfully, things are slowly starting to get back to normal after about six months of chaos, shopping, reorganisation, relocation and, at times, barely contained nervousness over moving our Neighbourhood Centre and Flexischool to a new and permanent location. Finally we have a real home; it's the first time ever in our 17 year history that we have a building to call our own. We'll never have to move again because we can't afford the rent or because the neighbours don't approve of our clients coming and going. But now the move is complete, all the furniture, equipment, odds and ends purchased and installed. New services have started, old ones expanded, and with the opening last Friday a wonderful confirmation of our community's support, I can relax and just get on with my job. Phew! Lunch on the verandah after the opening. Now I can come home again and centre myself here. There have been many days in the past few months when I have bought bread rather than make it, left the floor unswept because I was too tired to do it, or sat to knit and gone straight to sleep in my big old floppy armchair. It goes to show that I am not the perfect angel many think I am and just like many of you I am overwhelmed by my life at times. It happens to everyone and we all cope in our own way until things return to normal. And that is where I am. I'm looking forward right now to a gentle slow day when I catch my breath and start putting things to rights. Hanno is taking a group of seniors out in the bus today. They're going on a boat cruise along the Pumicestone Passage, back to the Tavern on shore for lunch and then home in the bus. Price $5, it's subsidised by our Neighbourhood Centre and a partner. 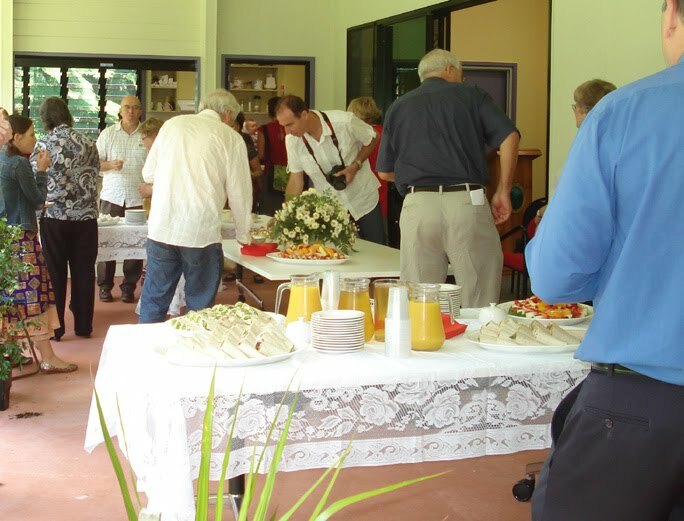 It's a lovely day out for everyone, that gives our seniors a memorable day with friends but keeps them on budget. So that leaves me home alone. Summer in a bowl - my home made peach jam. I still have three litres of it (shhhh). I have some tasks I enjoy doing this morning - potting tomato seedlings into larger pots, building up the worm farm, and moving pot plants around for the winter conditions soon to be upon us. Of course, I'll make the bed and sweep, but no bread making today as I'll be here by myself, so I'll make a tea cake for morning teas. 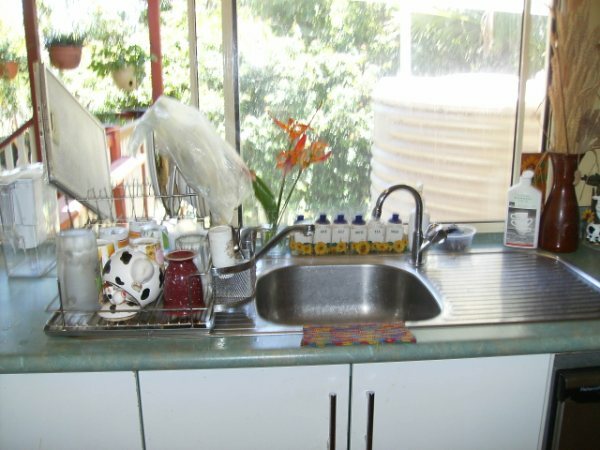 There is a load of washing that needs to be done and later in the morning I'll sweep and tidy the front verandah. It will be sunny out there then so I can rearrange my pot plants for the winter sun. Some of the chooks wandering in the backyard. To tell you the truth I could do almost anything here at home today and I'd love it. Just knowing that I have that big job behind me and many sunny winter days ahead, fills me with the kind of pleasure they often talk about in advertising but always fail to deliver. 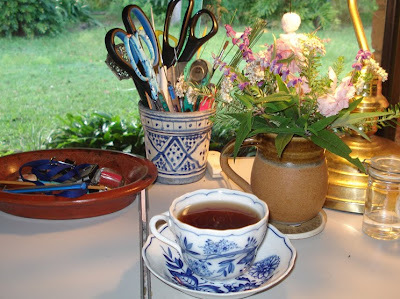 Being here, pottering around, freshening things, gardening, cooking, baking and keeping my home in a way that suits Hanno and I are the small things that keep me going with love in my heart. Nothing else gives me the kind of joy I feel when working in my home. Oh, I love doing all manner of things and I get pleasure from many of them, but homekeeping - that warm and comfy feeling of knowing I'm fluffing up our nest and that in this space we call home, we can close the gate and be alone, together, that, my friends, is worth a queen's ransom. I wish you a day full of peace and joy too, and I hope that like me, you'll find some time for knitting or whatever it is that you relax with. Today's kitchen is in the beautiful far north of my state of Queensland. 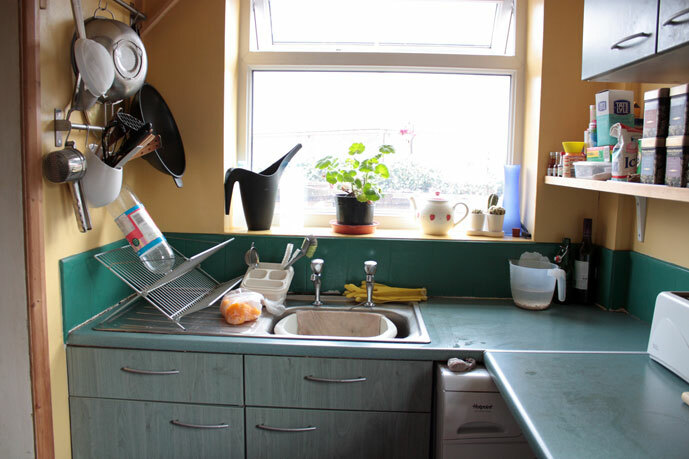 It's Joanna's kitchen, I'm sure you'll enjoy her story. "We live in Far North Queensland on the Atherton Tablelands, in a small Queenslander cottage. 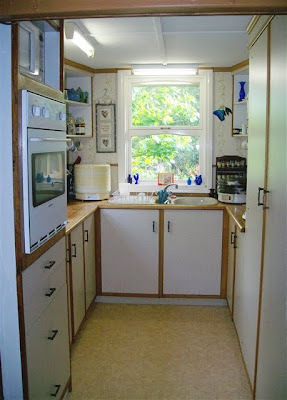 The kitchen is cute, but TINY! It's about 1.5 metres wide by about 2.5 metres long. It has a double burner gas stove and a smallish wall oven. In this photo I've got two dehydrators on the counters, but they are put away when I'm finished with them to save space. There's no room for a dishwasher, but I've got four little 'dishwashers' running around helping, so that's okay (as long as they're not all in the kitchen at once!). The fridge and the open cupboard where I display my glassware are just outside the kitchen, in the dining area. 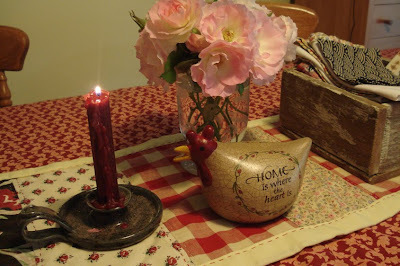 I like the country feel to my kitchen, and I really don't mind it being so small (usually!) as I don't have a lot of appliances - just my Thermomix, dehydrator, electric frypan and crockpot. At least it doesn't take long to clean! 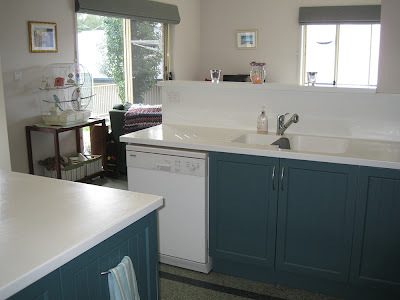 The counters are made of wood and the sink is enamel. 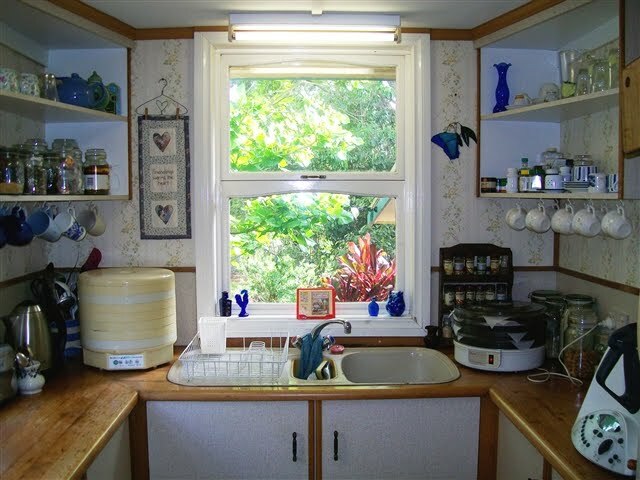 I love how the windows open out into a tropical garden, where I can watch the birds and butterflies as I cook! 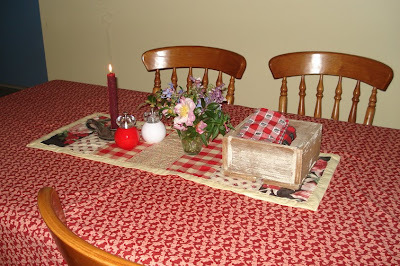 Hope you liked this glimpse into our home." I may be missing for a few days this week - our internet is going from one company to another. If that happens, I invite you to read some older posts. Take care everyone! 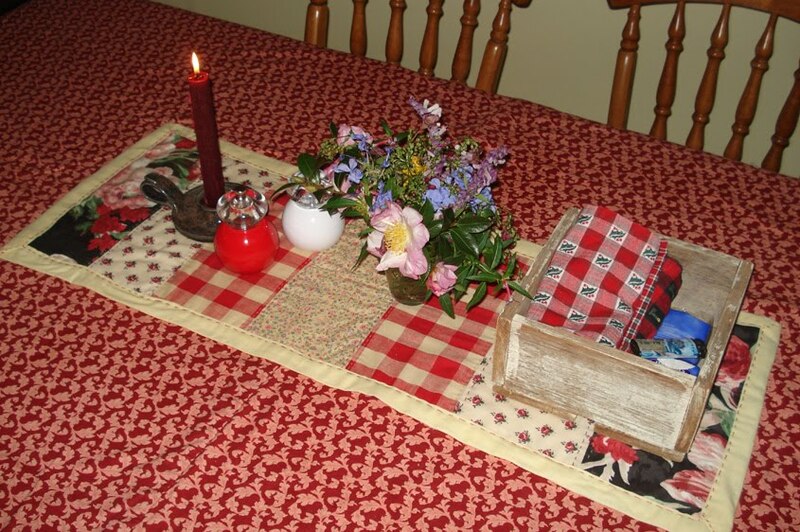 I was asked in an email recently if I would reveal the secret of simple living. I have no secrets, I think I've been fairly open with what we're doing here. I have a set of values I live by and everyone knows my day to day activities, so that was my reply. An email came back that surprised me quite a bit - it said that she had done most of what I was doing, made sure she planted what I planted, was knitting dishcloths and cooking from scratch, making soap, and a lot of other things exactly as I had written about them, but she had failed to find contentment. "What is the secret of contentment?" Let me answer that question first and then I'll elaborate. The secret of contentment is to live the life you want to live. It must be your authentic life, not a copy of mine or anyone else's. The secret is to find what you're passionate about and to carefully weave that into your life. The secret is to think carefully about what makes you truly happy, and then live a life that reflects that. I developed a certain set of values a few years ago and that value set, if I live true to them, makes me happy and content. I know deep down in my bones that if I am generous, kind and helpful, if I live slow and according to my values, and not those of mainstream Australia, if I give while expecting nothing in return, my life sails smoothly, even on troubled waters. It's a circle. What you give out, comes back. Always. I often urge readers here to live their own lives. What Hanno and I do is what suits us, it's not written about because it's THE way. To find real contentment and to live well requires that you examine yourself and find what it is that makes you happy. You need to think about how you want to live, what kind of person you want to be, what you want from life and develop a set of values that helps you live that way. That is not easy to do and it takes a long time to figure out. This part of the process is slow too. You don't wake up one morning, think "I'm going to live simply" and then just copy how someone else lives. Every element of your life must have meaning; making soap because I make soap is ridiculous and time consuming. Make soap only when it makes sense to YOU. 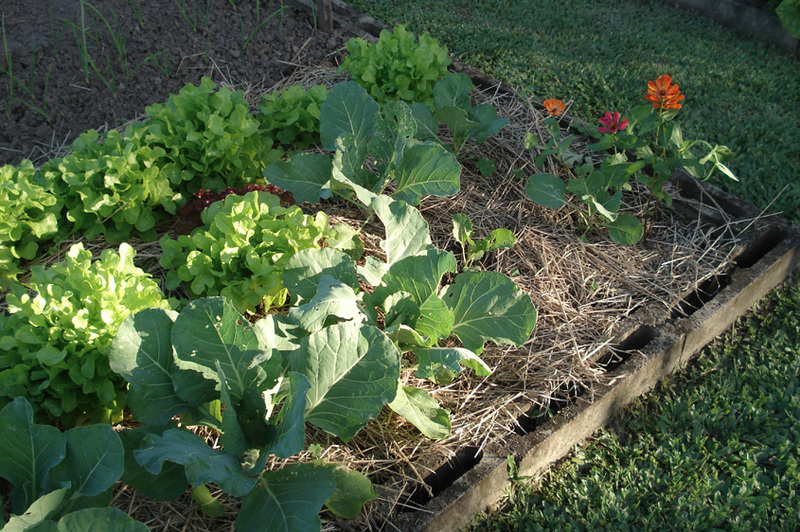 One of the advantages of this way of living is that it's organic and flexible and can be made to fit almost anyone. Unlike mainstream living you don't fit a mould, you break the mould and then start adding and taking away until your life suits you. You start with the mindset - the practical things that make up daily living change according to how old you are, whether you have children living with you, how much money and time you have. Find what makes you happy and do it. If you can't do it now, actively and earnestly work towards it. And always remember, there is no final destination - we are in this for the journey and where it takes us. 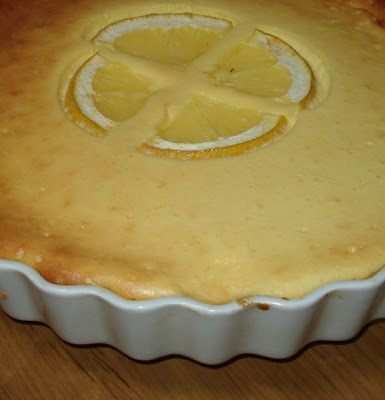 Make a pastry case, my recipe is here, but you can use any good short crust pasty recipe. 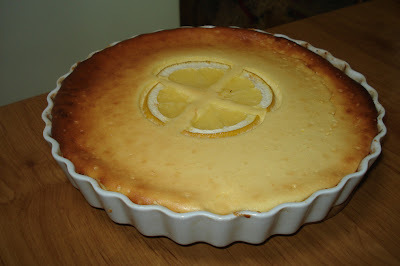 Blind bake the pastry and allow to cool. Put all the above in a bowl and beat with an electric beater for about three minutes. 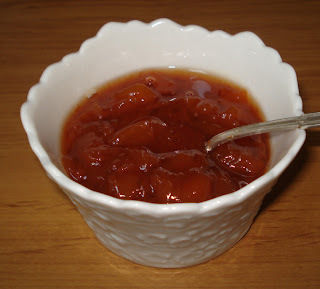 Everything needs to be combined well and the sugar dissolved. Pour the filling into the pastry case and bake in a slow oven, around 160*C/320*F. The filling should set around the edges and still be a little bit wobbly in the centre. Today we visit Affienia's kitchen in Leeds England. This is another small kitchen and it shows beautifully what you can do with a small space and a bit of thought and creativity. "Here is my kitchen. The first is taken with me leaning on the fridge, the second with me leaning on the sink. As you can see there isn't much room to move! The 3 shelves and the racks with the knives etc on were all added by my other half in the 3 years we've been here. He also added the section of sideboard that the bokashi bin is on and a folding piece of sideboard that appears in front of the back door. We have plans to decorate at some point as the tiles are painted and it's all peeling off. 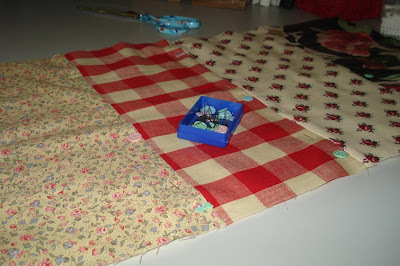 I think there will have to be Gingham in there somewhere. 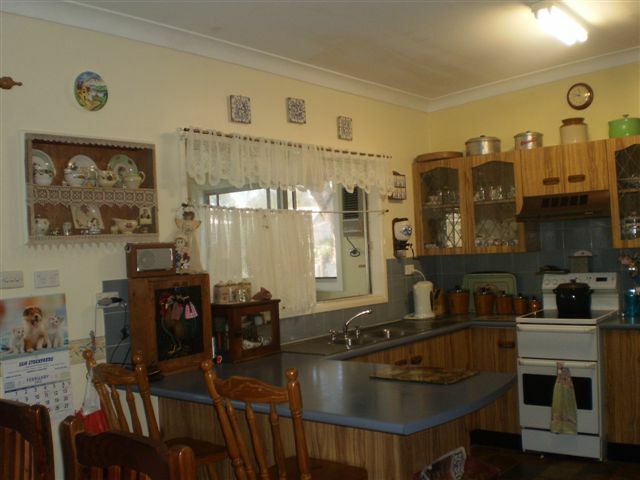 All kitchens need Gingham I think. 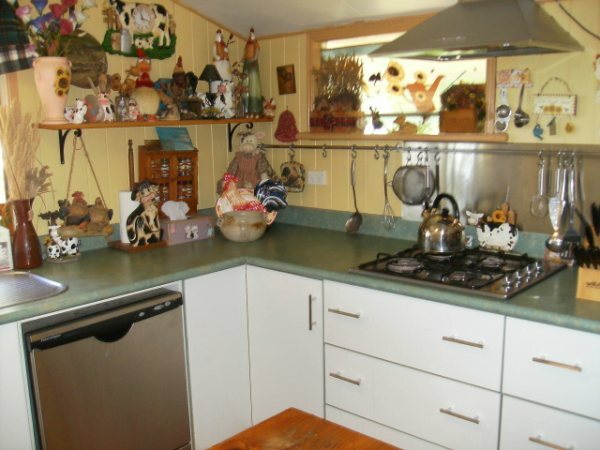 I dream of a big farmhouse kitchen with a large central island to work at. But I have learnt to work in this kitchen if not to love it. I feel best about it when there is fresh bread on the side and all the washing up is done :o)"
When you think about it, the only time we working and middle class people get to do exactly what we want everyday is when we retire or when we're on holiday/vacation. I guess we have a fairly free and easy life in childhood and as a teenager, but then there are people telling us what to do and when to do it. Retirement, whenever it happens, is all about freedom. It's the freedom to do exactly what you choose to do each day, the freedom of time, and even though the weekly wage stops, if you've gone through several simple decades, and arrive at retirement's door with no debt, no mortgage, a roof over your head, money in the bank, some investments or a pension, you'll be fine. There may be a few upheavals and you'll have to get used to a slower pace to your days but life in your 60s and I'm hoping beyond it as well, is wonderful. I have never been happier than I am now. Things are different when you retire. Many of your expenses drop, your priorities change and you'll have time to bargain shop and to make a lot of the things you used to pay someone to make for you. Depending on where you live and what benefits your government gives its seniors, you'll have to look at your budget now and make all the changes necessary. For instance, in Australia, when you're on an old age pension, you get goverment discounts on your property rates, ambulance, telelphone, pharmacy costs etc. Hanno and I decided to keep our private health insurance, even though it's very expensive, it gives us peace of mind to know that we can get medical help, choose our own doctors and go to hospital if we need to without having to go on a waiting list. Before you sit down to redo your budget, find out exactly what you're entitled to and claim it - it's one of the many reasons you've been paying tax all these long years - now you get a few pay offs. There are other benefits too - just yesterday I parked my car in a seniors parking spot for the very first time. It was close to the front door of the place I was going to. I felt like a bit of a fraud to tell you the truth, but the sign said "senior parking" I am a senior so I parked there. Nice. Check out the businesses in your area as well because many give seniors' discounts. In the months before you retire, start thinking about what you'll do on a daily basis. If you've always gone out to work, you might find it difficult to adjust but if you decide on your activities, whether they be home-based, volunteer-based or out in the community at a club or library, if you have something planned, you won't be sitting there on the first day wondering what to do. As you all know, Hanno and I are as busy as we want to be. We decided that we would use our retirement to provide as much for ourselves as we could. That involves all sorts of home-based tasks like maintenance, gardening, cooking, baking, recycling and mending. Living like this gives us variety and interest to our days and even though we've been working away here for several years now, it still feels fresh. We take breaks whenever we want them, we take days off and sometimes we take ourselves out in the car for an outing. It's a peaceful and rewarding life full of the enrichment that comes from being self reliant and independent. Of course we do some voluntary work too. I am the coordinater of our local neighbourhood centre and Hanno drives the bus there. He collects food in the bus from the Foodbank in Brisbane and takes our seniors out on shopping trips and excursions. If you have the chance to do some voluntary work, grab the opportunity with both hands because, in my experience, it has been rewarding and life changing. Pass on what you know. I believe it is my duty as an older woman to pass on what I know to those younger. Older people are our connection to the past and if we don't tap into that, many skills and memories will be lost. If you still have great grandparents, grandparents or parents living, ask them about YOUR history. Even if you're not interested now, I guarantee you there will come a day when you will be interested and if your loved ones are gone then, you will never know. Write down what they tell you so you can pass your family history on to your children. And speaking of history, get rid of everything in your home that you don't need. Ask your family if they want that second or third set of dinner ware. Donate old clothes to charity. 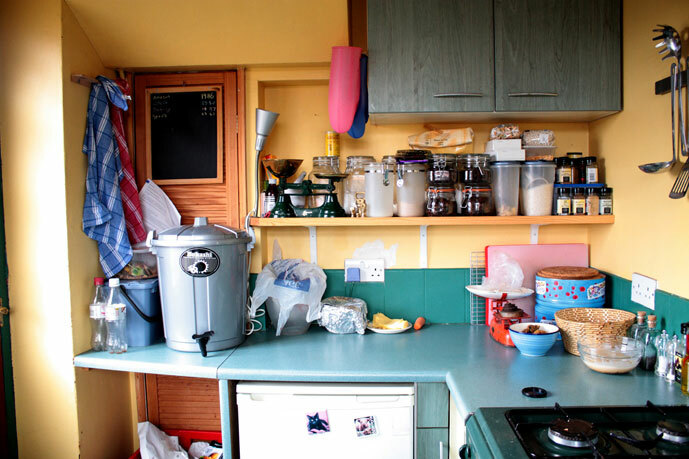 Clear out your cupboards so you can let more life in. Stay active and look after your health because things can come back to bite you in your 60s and 70s. I have been lucky so far and haven't had any health issues and I am confident that I'll be out in the backyard when I'm in my 80s, yelling out: "Hanno bring me the camera please. There are new birds here!" Keep cooking from scratch and eating wholesome food. Even if it's only one of you, it's important that you eat well. Many people have an unrealistic idea of old age. They think we oldies are helpless and feeble and not capable of much. Well, I'm here to tell you that the majority of us are just fine and dandy, thank you. We may not be able to lift what we once did and we may be taking naps in the afternoon (I am), but we're still waking up every morning eager to get stuck in to our tasks and to get as much from the day as we can. Don't be scared of aging. It has many rewards, and retirement, and the freedom that comes with it, is one of life's golden eggs. PS. Go here and read Sonya's excellent post on learning and losing life skills. I am happy to tell you that Sonya is coming to my home this morning to learn how to knit. No doubt we'll talk of other matters too. We all have to do this. If you know someone who wants to learn something you know how to do, offer to teach. It's the only way. You don't see or hear of genuine articles much nowadays. In my youth, it was a fairly common expression that meant something or someone was authentic. I don't hear the saying at all connected to things now. I believe that's because people are less concerned with the genuine now and more concerned with fashion and acquisition. It matters not that something is true to its type, or that a person is outstanding because they're eccentric, unusual or passionately devoted to their beliefs and values. Nowadays, it seems to me, that popularity is more important than rarity, it's safer to blend in with the crowd than have the courage of your convictions and that celebrity wins over the genuine article every time. I really love it when I come across a name that everyone seems to know but I've never hear before. Hanno and I were watching the morning news on TV yesterday when the presenters were droning on about someone called Kim Cardasian. Apparently Kim has millions of Twitter followers and is famous far and wide. When I come across something like this, I smile and feel like I'm doing something right. That somehow, even though millions know this person, this famous name has been filtered out of my simple world. I have no clue who she is, where she lives, what she looks like. That, to me, is success - I've filtered out a small shard of popular culture - gee it feels good.! I didn't get caught up in the hype or seduced by a need to know. Even now, I decided not to Google her name to check my spelling. The less I know about Ms Cardasian, the better. So what of the genuine article? Why do I hold high such a concept? It's because it's easy to go along with the crowd and much more difficult to walk your own path. In many different ways we are all walking the path less travelled. We see what is considered "normal" now, we know that consumption is the new way and we have decided to reject it. Instead of buying all that is new and shiny, in the latest fashion colours, we are standing our ground and going back to basics. It's comfortable back there. It's warm traditional oats soaked overnight and cooked slowly rather than cornflakes or all the new designer breakfast cereals; it's home baked bread instead of sliced white in plastic wrap; it's "come over and I'll teach you how to knit" instead of "let's go shopping". Instead of buying fast food, we have it slow and easy bubbling away in the oven when the family comes home in the evening. Even the smell of that home cooked food in the air when they walk through the door tells your family that someone loves them enough to make it all happen. It's sitting around the table with the entire family, talking about today, and tomorrow, and this and that. It's really knowing your family instead of just knowing what they tell you. After the spaghetti and meatballs I served this lemon tart. There are so many things that can be fake now - fingernails, breasts, flawless skin, "home cooking" that is bought over a counter or in a packet, "limited editions" that sell thousands and sometimes millions. So when you see the genuine article, be that in a person, a way of life, or the ideals they engender, it stands out like a shining beacon. There has probably never been a better, nor more difficult time, to stand up for the authentic, but doing that, going against the tide of popular opinion, and seeing others doing it too, will help you reject the flim flammery of the popular and hold close the values and beliefs that will help you lead a simpler and genuine life. So now you've moved into your 40s, maybe even your 50s. During your younger years I'm sure you heard all the negative silliness about aging but now that you're middle aged, you'll realise you're in the prime of your life. You feel confident, ambitious and capable. You are at the height of your money earning power, so you can pay off more debt now than at any other time. Decisions made in previous decades about reducing debt are now starting to pay off and you can see the light at the end of the tunnel. Hopefully, with a bit of hard work and determination, you'll pay off your mortgage now and keep putting something aside for your retirement. Try your best to pay off your mortgage before you retire. And again, do not add to your debt burden. Less is best. If you're working, it is a wise step to put money aside all through your working life for your retirement. In Australia, this is called superannuation and the government adds 9% of every employee's annual earnings to their superannuation fund. Most employees earning over $450 a week must put a certain amount of money into their own fund too. They can add more if they wish and receive tax benefits for doing so. Most Western countries have some form of government assisted retirement funding. You do not need as much as most investment brokers say you need. For example, Hanno and I live well on less than $25,000 a year. Make sure you keep all you superannuation/retirement funding in one account. As you move from job to job throughout your working life, make sure you have the details of your chosen superannuation/retirement account to give to your new employer each time you change jobs. If you let them put your contributions into the account they usually use, you'll end up fragmenting your investment. The more money you have in one account, the more likely you'll receive a good return on the investments made on your behalf with that money. If you've got money in several accounts right now, I encourage you to take some time in the next few weeks to contact those companies with the details of where your funds should be and instruct them to transfer them over. There may be a fee for doing that, find out what the fee is before you do it, but in the long run, you'll get a better return if you're funds are in one account. That is why it's important to give your information to each new employer you have over the years - you'll avoid paying transfer fees. Children need to be taught life skills all through their lives, and now, in their teens and 20s, is no exception. Of course, you'll hit a brick wall if you've never tried to provide this type of parenting before - this is a life long style of parenting, starting when they were toddlers. Now you're at the pointy end, now you have to reinforce what you've been teaching them all their lives, now it really counts. As in previous stages you make sure you are a good role model for them and always be the kind of person you want them to be. Now you teach them about being a good and fair employee, you talk to them about how to treat their friends and acquaintance with respect, and above all, you help them develop self respect and confidence. There are also the practical skills like driving, shopping for groceries, cooking, looking after their own clothes - how to wash and iron them, and saving. Even if you've encouraged saving and focused on money management before, now is the time to reinforce all that again because there will be a lot of peer pressure to spend, spend, spend. This is the most difficult time for a parent, but it's also the most rewarding. If you can set your children out into the world, fully equipped with the life skills they need, as well as the formal education of schooling - in whatever form that took in your family, you will have given your children their very best chance of a happy and successful life. As you age you'll realise that you don't have to please everyone around you. You mature, and part of that maturity is to make yourself content. This is the time of life when the children have grown out of their very dependent stage and with that, you get more time to yourself. It's not as freeing as when they leave home, but at this stage you get an inkling of how things will be when your babies fly off and make their own lives. Now is the time to develop your hobbies and to get enjoyment from the things you choose to do. You'll have the time now to learn new skills, develop your passion for cooking, or painting, sewing, gardening, hiking, camping, or a hundred other things you'll now have time for. If you choose to live like Hanno and I, now is the time to develop your home and land so it can support you in later life. 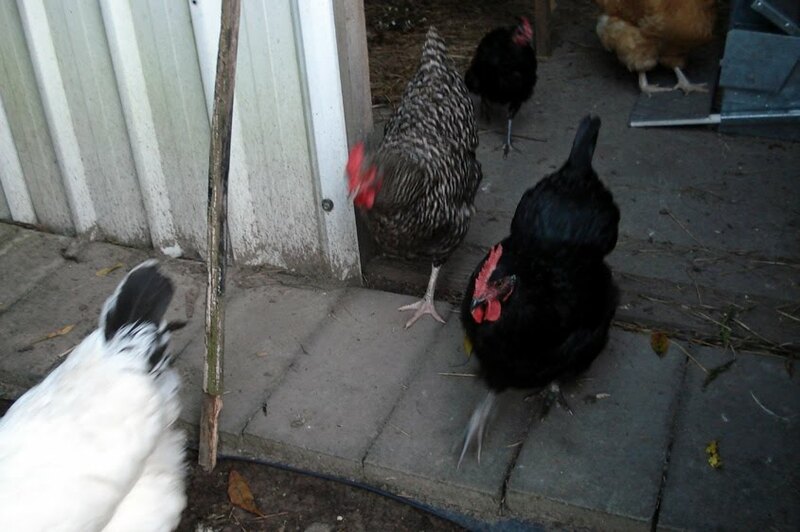 You might add chickens to the backyard, if you haven't already done so, you might add bee hives, aquaponics, or a couple of milking goats, and, of course, along with whatever you add, you should learn all you can about it. Do you need to add more fences? You should do that now. Whatever requires strength and energy, add it now because in your 60s, your strength will start to go and you'll wish you had thought to do it earlier. If you're hoping to live with some degree of self sufficiency, now is the time to learn how to do everything that will help you with that aim. You'll need to learn how to bake, put up jams and preserves, mend clothes and shoes, if you're a couple, divide the chores and learning up between you both with each taking the things you enjoy doing. I like doing the inside tasks here and Hanno enjoys being outside, so he does most of the traditionally male chores like home maintenance and I am the homemaker. Now is the time to look into how you can develop your knowledge and understanding of your roles. Read - both books and blogs. I believe blogs are a wonderful way of seeing how others are living so you may pick the bits that you want to do and incorporate them into your own life. When you're entering the final years of your fifties, and while you're still earning money, do an audit of your home. Look at your home in another way now - you want it to support you in your older years, you do not want it to be a burden. Now might be the last time you have a chance to change what you don't like and what doesn't work for you. Look at your furniture - is everything in good order? You might need to replace a few items, but do so at the thrift shop, not the department store. There are many items of old or antique furniture that may suit you that have been well made and made to last many years. Even if you have to have things recovered, revarnished or painted, you'll end up with a more sturdy and longer-lasting piece than buying furniture from China or Vietnam. You'll realise as you get older that you need much less so now is a great time to declutter. You can give some of your odds and ends to your children as they leave home and start living their own lives, so keep a couple of boxes of the good stuff for them to use, and give away or sell what you don't need. 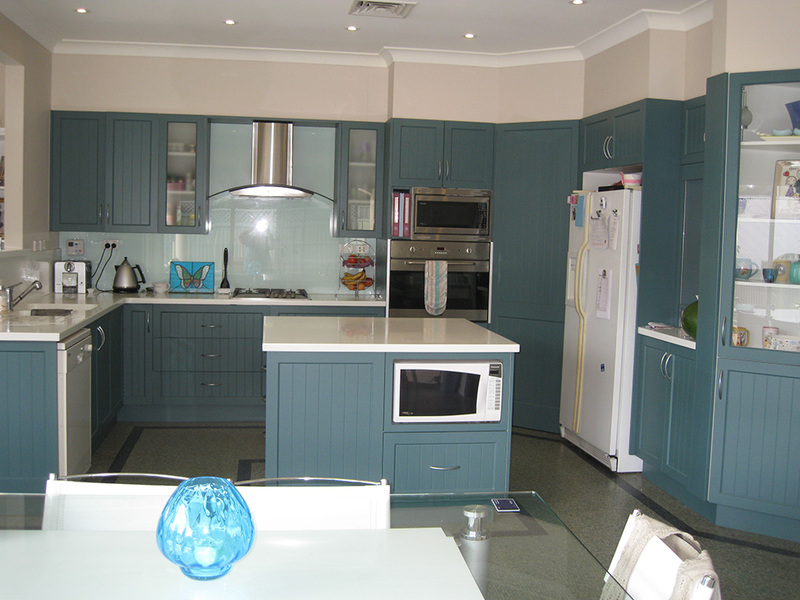 Today we have another Australian kitchen, in the state of New South Wales. 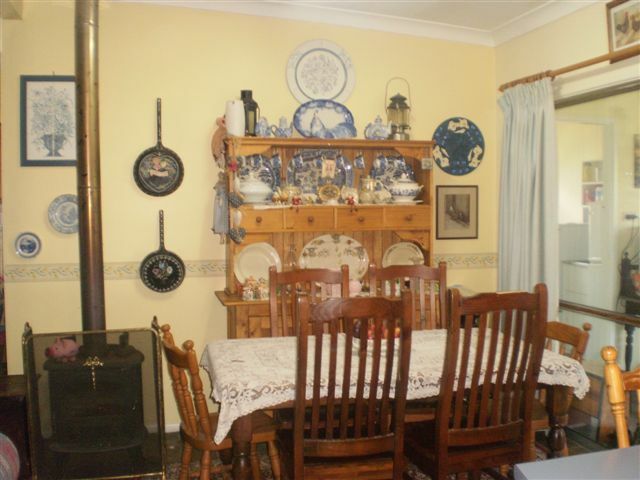 It's Carole's kitchen and as you can see it's packed with character and looks like a real cook's kitchen. "I live in a little town in the Hunter Valley N.S.W. my kitchen is great to work in. 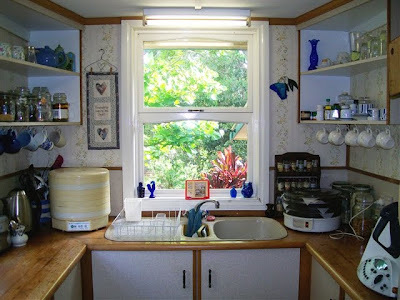 The window you see looks onto a little sunroom we built for my 89 year old Mum who lives with us you can see straight out into the back yard at the chickens, roses and a waterfall; we love it. The little shelving you can see is where an old air con was and the builder made it into curio shelves for me; my jug collection is on them with antique laces for dividers.The cabinet with the rooster is for my spices. My husband made it out of an old wardrobe and I painted the rooster. The small cabinet beside it is an antique sterilising cupboard full of little treasures. 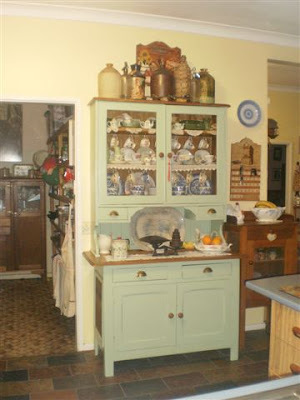 The 2nd pic is of our loved Irish dresser full of Willow Pattern which I have collected for years, and the little egg cupboard was made by Bob and painted by me; as you can tell we love chooks. The third one is of my other dresser with all my collectibles, this is also part of the kitchen. I heard myself say this on radio the other morning: "Being thrifty is not about large amounts. You rarely make those large savings. It's more about constantly looking to save small amounts because over the course of a year, those small amounts become your large savings." When I finished the broadcast I thought about what had popped out of my mouth and that I should practise what I preach. I decided to review my phone and internet bills. We've have had the same internet provider for many years - Optus. They've provided us with years of reliable service and apart from bumpy downloads because we lacked speed, we've been happy with them. On the other hand, we weren't happy with our phone company. We've had our account with them for a bit over two years and although we have a $29.95 account, we pay for all calls and when our bill arrives it's usually around $70. With the phone and internet combined we were paying $120 a month and still restricting our phone calls a lot. After about one hour research online, we decided on staying with Telstra but increasing our bill to an Ultimate plan - $89.90, but with unlimited local and interstate calls, reduced calls to mobiles and either five cent or two cent/minute international calls. Adding the internet to that bill and bringing over our account from Optus gave us fast broadband with double the gigabytes for two dollars less than what we'd been paying. It's not much in savings but the plan we're on now is much better value for money. That's what you look for with these essential services; it's not so much the savings, although you do want them too, it's more about the value you get for your hard-earned dollars. So we've now got a phone account that will allow us to call our relatives and friends either free or for a much smaller cost than we used to pay and we have doubled our internet download allowance and it's much faster. And all that for two dollars less than we used to pay. These occasional reviews of how we spend money are an essential part of living well within the confines of a small budget. Don't forget to look at how you're spending your money on these long term accounts. Technology is moving ahead rapidly and what you paid a premium for when you first took on that account, might be old hat now. It's worth a bit of research and talking to your account providers - they will not want to lose you as a customer. If you do your research, phone them with a polite attitude and ask for their advice, you may be surprised to find savings or better services there, or both. It doesn't take much to make me happy, I'm on the verge of it every day, but yesterday as I worked at my voluntary job, I kept thinking about this phone account and how it would allow me to phone my sister whenever I felt like it. She lives a thousand kilometres away and in the past we've rationed the calls. Just thinking about it gave me a really warm feeling and as soon as I got home yesterday afternoon, while Hanno was still cooking our dinner, I phoned Tricia ... just because I could. We are in Gail's kitchen today. 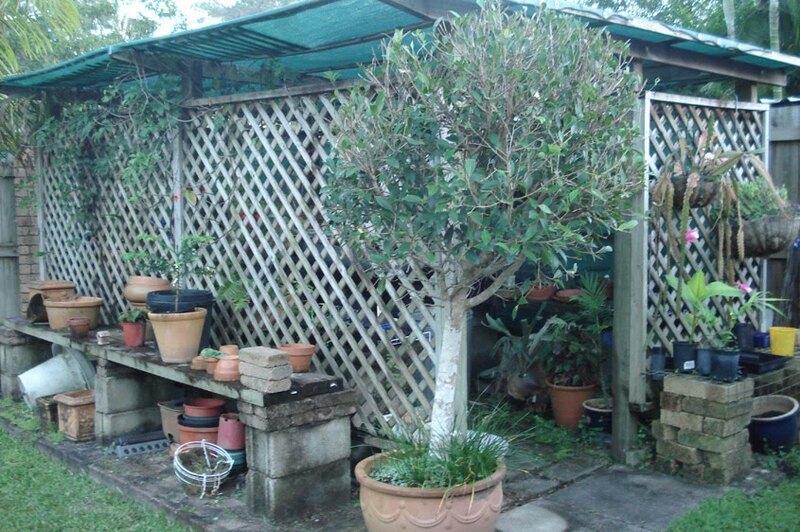 Gail lives in a Queenslander, which is a house up on stilts, surrounded by a veranda, usually on all sides. They're wonderful old, distinctive houses that were built to suit living in the tropics. "This is my kitchen, it's an 100 year old Queenslander that my hubby and l brought 10 years ago. We have spent the last 10 years doing it up, we have nearly finished. 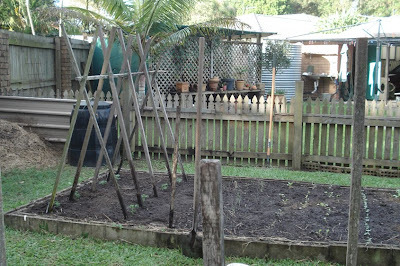 Most of the work we did ourselves or had someone help hubby to do it, it took a while as hubby has to work full time. In the kitchen we replaced everything including the floor boards, we replaced the cupboards with drawers, which are more convenient, l collect tea pots, cups and saucers, milk jugs, anything with country animals on it, l love spending time here. Thankyou for coming to visit." Today is a day of absolute pleasure for me. I'll be sitting in the shade of the verandah reading one of my new books; tea will be had in the "good" cups. I'll knit and maybe go out for morning tea with Hanno. I might even do some more research on my family tree. Today is my birthday, I am 62. It seems like a good day to delve into my own history. So far, I'm back to my great, great, great, great, great, great, great grandparents Thomas Bond and Grace Cook who were married in Yardley, England on 27 March 1654. I've found two convicts on my fathers side - who came to Australia in 1799, and a soldier who accompanied the convicts on my mother's side - I have a letter he wrote in 1820 when he lived in King Street Sydney. That address is now in the middle of Sydney's main business and shopping centre. I'm pleased you're enjoying the current simple life series. Thank you all for your comments. I hope you have a lovely day. ADDITION on 16th: Thanks to every one who took time out to send me their special birthday wishes - I have an avalanche of emails and facebook messages as well as your comments here. I love your messages and appreciate your friendship. Warm hugs to you all. Hopefully you've landed in your thirties with only a few debts and a passion for living simply. If you have, you're in the driver's seat. If you do have some debt, there is still quite a lot you can do to untangle yourself before it strangles you. The important part of this stage is that if you can set yourself up properly here, if you budget and pay off debt instead of add to it, you'll be fine. It has been my experience that if young people aren't already attached in their the late twenties, now is the time they start settling down. There is something about the thirties decade that compels us to find a mate and start having babies. Even if the babies question doesn't come into the equation, many people seem to choose their thirties to slow down, find a partner, take stock of their lives and mature. Before you dive into marriage or parenthood, sit a while and talk to your partner about what that will be between the two of you. Some people don't want children, some want many. Some people have an unquestioned assumption that there will be one parent at home raising the children. Others believe that the children can be looked after in day care or by an accommodating grandparent while the parents work to pay off the home and make the most of two incomes. Don't think you know what your partner is thinking - this is an important part of your life and you need to talk about it, don't just let it happen. No matter what your choice, you should work out your strategy early, not when the children are toddlers and things aren't working out how you want them to. I am not judging anyone here, the choice is entirely yours. If I knew you personally, I would support whatever decision you made. I believe we must support and encourage each other in our important life decisions, not criticise or mumble when backs are turned. No matter what you choose to do, either stay at home to raise your children, work from home, or go out to work, this decade will be one that is dotted with times you'll feel overwhelmed and tired. It goes with the territory, but it makes you stronger. So, you've finally reached your thirties. It's not as bad as they said. Right? What you do now could set you up for life. If you have the means to buy a house, do so. It's still the number one best way to grow your personal wealth (oh how I hate that word. Please excuse its use.) If you're not already in your own home, start making plans to save for a house deposit. Even if it puts you back a few years, it's better in the long run to save a hefty deposit rather than a meager one - or, and I hope you don't do this - borrow the entire amount for the home. Step up and save for it. It will result in you paying less interest in the long run. There are so many things you can do now. If you're married or living with a partner, discuss how you'll save. If both of you are working, try to live on one wage and use the other one to save a house deposit or pay the mortgage. This is a time of sacrifice, my friends. You'll work hard, get tired, go without, regret decisions made, wish you'd done things sooner, or never, but in the long run, you'll come out the end of this decade stronger, more self assured and convinced that you can attain your goals. One thing I know to be true, working together as a team, especially when times are tough, bonds you to your partner like nothing else. Hardship makes you tougher and more resilient. And here is one thing that I want you to remember - being thrifty and not wasting your money on flim flammery is not being cheap or miserly. It's a mindset that will help you achieve your goal of living well, being content and happy. Learn how to stockpile groceries. It will save you time and money and both will be in short supply during your thirties. Plan your menus. This will help you organise yourself so there is less confusion around what to cook for dinner, you'll know in advance what you need to prepare the meals, and there will be less food waste. Plan your grocery shopping. Find the best supermarket close to you and don't be tempted by things you want but don't need. Pack lunches for work and school. Buying lunch every day is an unnecessary expense. 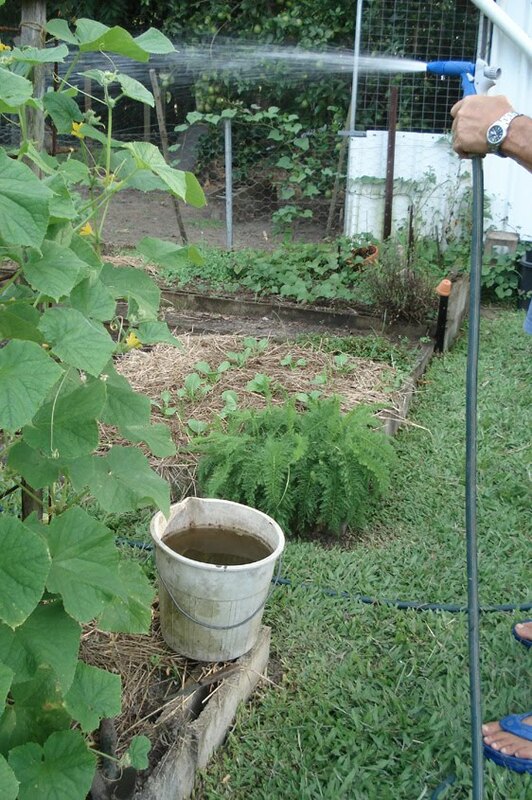 Learn how to make your own green cleaners. Shop at thrift shops for children's clothes or swap clothes with friends. Look on Freecycle or Craig's List when you need something. Stop using disposable products unless you absolutely have to. Don't use disposable nappies/diapers. Modern cloth nappies/diapers are comfortable for baby, can be reused for all your babies and don't add to land fill. Dry your laundry outside whenever possible. If you don't have a washing line in the backyard, string one up. How to build your own clothes line. Learn how to read your electricity and water meters. That skill will help you save a significant amount of money and natural resources over the years. 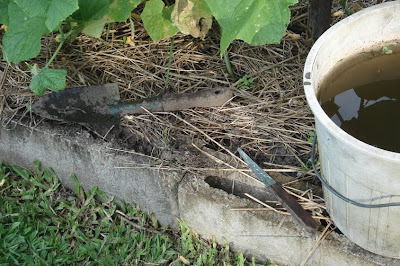 Click on the country to find details for water meters - Australia, United Kingdom, Canada USA. Click on the country to find details for electricity meters: Australia, United Kingdom, Canada, USA. Saving Electricity. Don't get into a habit of giving your children expensive gifts and clothes. You children only want you to feel safe and secure. They want to spend time with you and to feel loved - that is the most precious gift available, and it can be given every day. Look for entertainment that doesn't cost an arm and a leg. Frugal Family Fun. Do an audit on your own assets - do you need a second phone, cable TV, a second car? Get rid of everything you don't need that is adding to your cost of living. Try to cut back on your phone and internet bills. Starting your family will be like a minefield of conflicting messages and influences. But if you stay close, if you live true to your values, your thirties will set your family into a firm and supportive unit. Be a role model for your children. That is the most important thing you can give them - it's more valuable than any toy or fancy bit of electrical computery. Give of yourself to your chidlren and you'll get the best back from them. Aiming for the best for them will remake you too. Your children will see you when the outside world doesn't, they see you behind closed door when you aren't on your best behaviour and trying to impress. Even in those times, you must be a role model for them because they'll become what you show them. 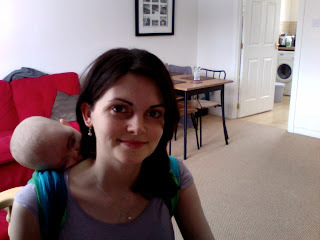 Amanda and Steve at the Soulemama blog provide a loving and confident example of what life can be like at this stage. If you've never visited that blog, go there soon and soak it all up. It's inspiring and gentle and full of happy children, home loveliness and contented parents. At Down in the Meadow the children are a bit older and a delightful example of family life. And finally, an Australian family I have only just discovered via Little Jenny Wren - Hugo and Elsa I love their stylish home, put together after trips to thrift shops and junk yards. It clearly shows just what is possible. If you are in your thirties and have a blog that illustrates the ideals I'm talking about here, please add a comment so that other readers can find you. Expect to make mistakes and learn from them when they happen. Continue to be self reliant. Continue to save for your retirement. Keep learning new life skills. Always support your family and your friends and be kind to yourself. I still get emails fairly frequently asking me to define simple living and if I can explain how to live like Hanno and I do. Many of the long term readers here would know that I encourage everyone to live their own life and while Hanno and I might be an interesting enough couple, our life is ours - it's what we do because it suits us, our personalities and the stage of life we're at. 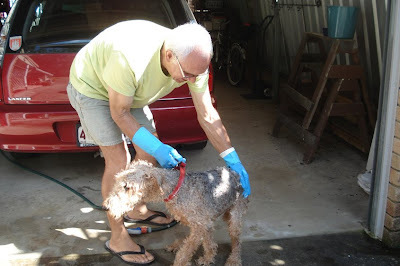 I write about our life here not so you might copy it but to show you what's possible, easy and enjoyable on retirement. I think the stages or seasons of living - those periods you progress through at various stages of life - are the key here. In each season you need to do different things - a simple life, like every other life, will reflect those seasons and the requirements of it. So with that in mind, I thought it might be a useful exercise to focus on a few stages of life in general, and see how simple living fits into those stages. I would like to start with what I know best - retirement, but it would not make sense to work backwards, so let's start with students and those in their 20s, then progress to the 30s, then middle age - 40s and 50s together, then retirement. Remember that this is my version of what it may be like, so please help me define these stages and what happens in them; I really want your input if it's the life stage you're currently in. Let me stress here that money should never be the most important thing in anyone's life, but it is the glue that holds life together, so it will feature heavily in every stage of life. Money, or more accurately, debt, will make or break the plans you have for yourself. When you first leave school, leave home, start work, or start university there is a very strong urge to buy everything you couldn't buy when you were younger. As soon as you start earning a bit of money, most of us want to create our own style - in what we wear, how we spend our time, where we live and what car we drive. I guess it's one of the ways we separate ourselves from childhood - the ability to earn and spend money is a marker of adulthood. The trick in every stage of life is to get through it with the things that make life worth living without being saddled with debt that we take into the next stage. The one debt that will travel with you through a few stages is usually a mortgage, try not to have other debts with it that tie you down. Learn how to budget as soon as you start earning your own money. You will still buy a portion of what you want but you'll be in control of your money instead of recklessly spending whatever you earn. At some stage in your late 20s or early 30s, most people settle down and think about buying a home. If you arrive at that point in control of your money, with little debt and maybe even the beginnings of a home deposit, you will have placed yourself in the best possible position. Whenever you want to buy something that you want but don't need, work out how many hours you need to work to pay for it. If you're earning around $20 an hour, by the time you take out what you pay in tax and what it costs you in the form of clothing, transport and grooming to earn that money, you'd probably get about $13 or $14 an hour in your hand. If you see a pair of shoe that you MUST have and they cost $100, you will have to work more than seven and a half hours - almost a full day's work, to cover the cost of those shoes. Is it worth it? If you're lucky and smart, you'll never stop learning. What you learn at school and university are just the basics - it sets you up for life but you need to fill in all the gaps in your education along the way. I can't tell you here what it is you'll need to learn, only you know that, but there are a few fundamentals that everyone should know. Now is the time when you'll start shaping your character and how you'll be later in life. Chance will play a part in your decisions if you don't make plans for yourself. Take control of your life, don't just react to what life throws at you. If you make plans, learn the various life skills that will help you live well and happily, you'll find that you can direct yourself towards certain paths. Take time out, think carefully about what kind of life you want for yourself, what your values are, what you value in other people and what your ideal life would be. Don't get caught up in the silliness of celebrity and wish you'd be a star, or famous. That lifestyle is difficult and can be toxic. Be sensible and think realistically about what might be ahead and how you can change it to make it the best it can be. Aim to be self reliant so that you may look after yourself throughout your life without having to rely too heavily on others. Learn how to cook from scratch. Over the years it will make you healthier and it's much cheaper than relying on convenience foods and fast food. Learn to bake, it's a lot of fun and people will love you for it. The bread, cookies, biscuits and cakes you make yourself will, hopefully, have no artificial flavourings, preservatives or trans fats. Find a mentor or role model. It could be someone in your family, someone you work with or someone you meet along the way. Ask questions, watch how they conduct themself be aware of their values and how they apply them to their everyday life. Get rid of friends who drain you or who are negative or toxic. Learn how to sew, knit and mend. This will help you extend the life of your clothes and if you're good at it, you might even be able to make some of the clothes you wear. I have seen some dresses, skirts, tops, shawls, scarves and bags on some young peoples blogs that are really fabulous and much nicer than store bought. You can really define your own style if you make some of your own clothes. If you have some land - use it. 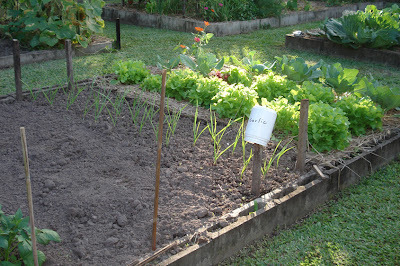 Learn to grow food. Disregard advertising. It is there to create an insatiable want in you. Don't give it any power, march to the beat of your own drum. Travel if you can - even if it's just to the next county or state. Expand your horizons by travelling cheaply by train or get a group together in a car. Self discovery - this is the time when you work out what kind of person you are, what you hope your life will be and how to gain those illusive goals. When you leave the family home, stay close to your family. They are important. Heather's comment made me realise I should have added this important note: expect to make mistakes. All mistakes are learning opportunities. And I liked Rachael's comment on starting early on your retirement savings. Your superannuation,/401K plan/pension scheme will serve you well in your older age, especially if you start it early. I would love any one of you, especially if you're in your 20s, to comment on what you're actually doing that makes your life enriching and satisfying. If you have a blog that focuses on this age group, let me know. If you have any links that may help, let me know. I am sure I've left out things that should be here but I welcome your input. Blogs of people in their 20s - can you send me some links to add here? I'd love to share some young bloggers who are studying, travelling, settling down, working at their first jobs, and living simply - single or married. There are more great blog links in the comments. Don't forget to check them out. I guess the one thing I'd like to leave you with is that your 20s is the launching pad for your life. If you can establish yourself on a firm foundation right now, learn the lessons that you need, create a circle of supportive friends and maintain a good relationship with your family you'll be setting yourself up to be in the best position to continue through to the next stage, and that one is a real spinner. If you thought your 20s were high energy, just wait - you're in for the ride of your life in your 30s. Today's kitchen is all the way over on the other side of the world. We have Rachael's kitchen in Scotland. On the windowsill we have rosemary, basil, mixed salad, rocket, beetroot, courgettes, spring onions and radishes which we just set up last weekend. It was beautiful and sunny and we though we we headed for spring but then we got a surprise fall of snow (hence the glare!). Hopefully our little seeds cope ok and we can plant them outdoors in May. 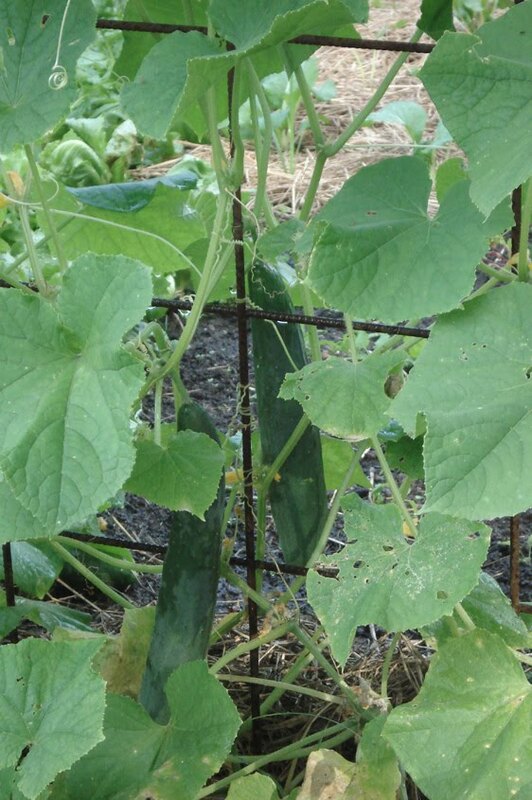 We have such a short season for growing anything up here! I couldn't really take a second photo of the kitchen, as there's not much to it, so I thought I'd take a photo of Kaelyn asleep on my back. This is our living room/dining area. Thanks for looking at my photos! I took this photo just 30 minutes ago after I let the chooks out for the day. 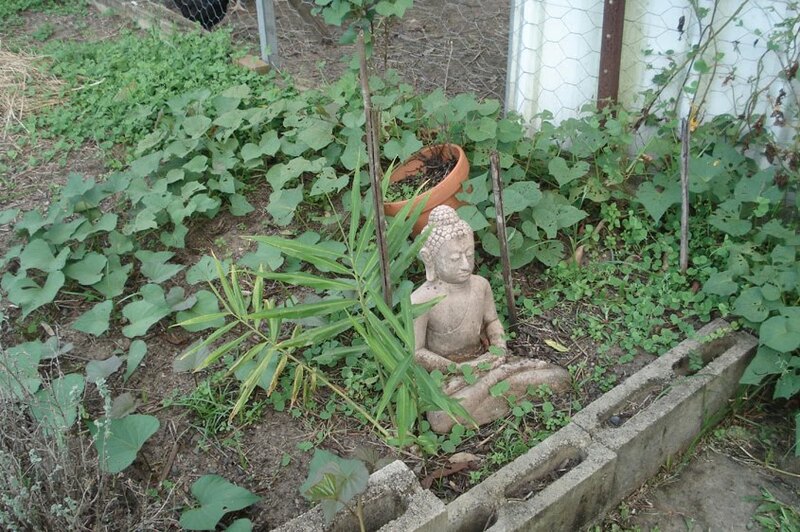 There is an air of serenity in our backyard. 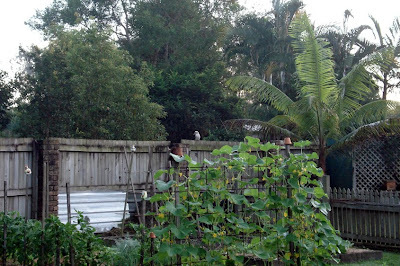 It's aided by the weather, wandering chooks grazing on green grass, the sound of unseen birds calling from the rain forest and the knowledge that here we can support our passion for home grown organic food. We spent much of yesterday morning outside. 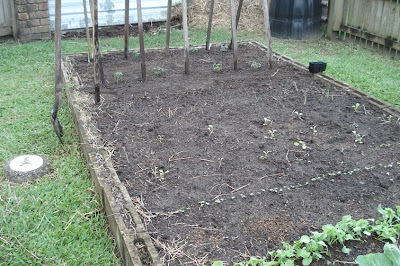 Hanno planted and weeded the garden and I spent time in the bush house sowing seeds and propagating ginger and turmeric. 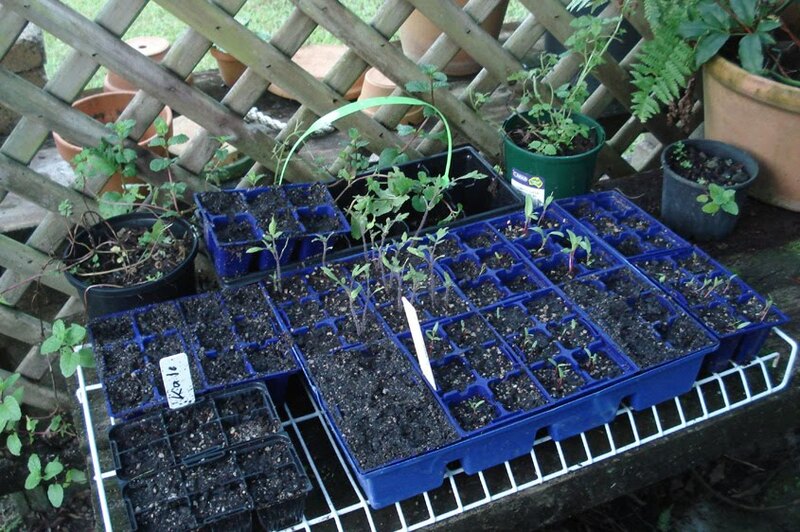 We have our first seeds and seedlings in and growing well, but to support the need for food next month and the month after, we need to have more seedlings ready to plant out. 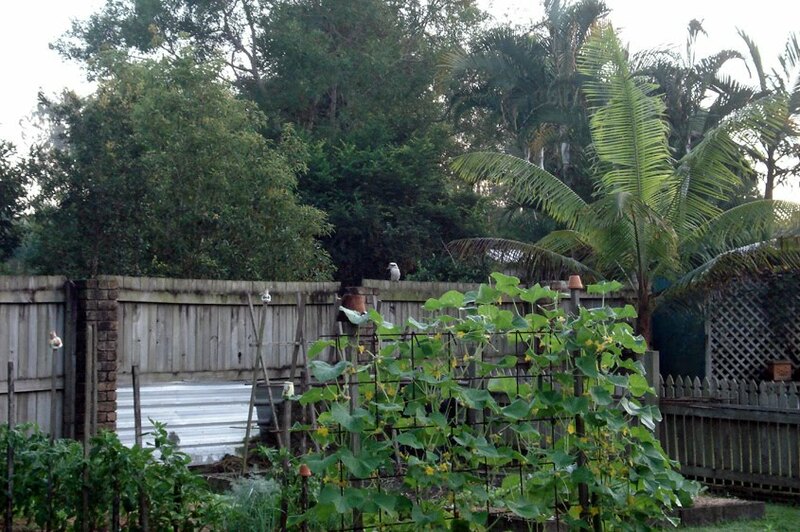 On the way back from the chook pen, I saw this little kookaburra on the fence watching my every move. When I was in Maleny last Friday, I went over to Green Harvest for supplies. I bought Scotch curly kale, celeriac, Wakefield cabbage - a heirloom sugarloaf type and a trio of organic Italian garlic heads. 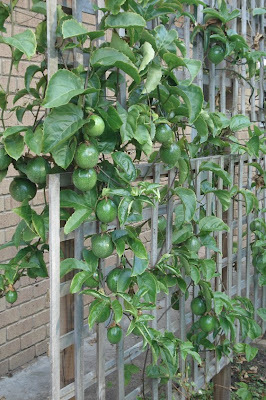 I always buy Green Harvest seeds, they germinate readily and there is a large selection of old varieties for me to choose from. 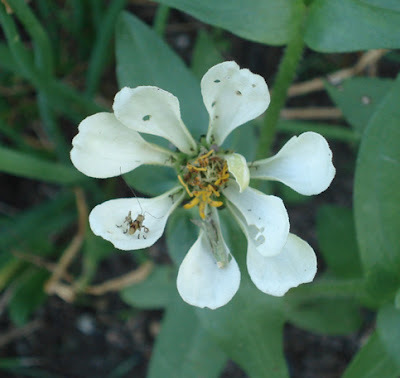 They're often local seeds too, so I know they're suited to the conditions here. The lovely Francis was in the shop when I walked in and after saying hello, she left me in the capable hands of one of the women there to place my order. Soon after she returned with a handful of perennial leeks. She had brought them in from her own garden for her staff and gave some to me to try. What a thoughtful and unexpected gift! Rush hour at our place is usually over in two blinks of an eye. Hanno was keen to get them in the ground yesterday morning and like our Welsh onions they'll happily grow out there for years without needing to be replaced each year. 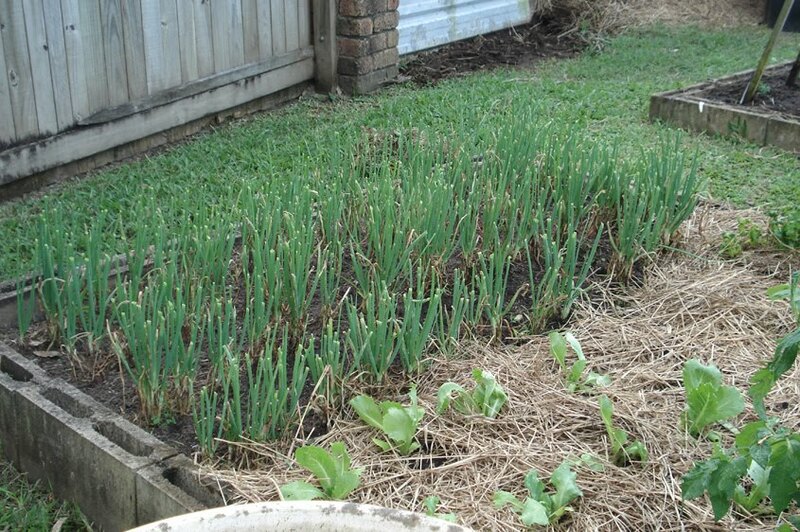 We have trouble growing onions here because of the warm weather so having Alliums in the form of Welsh onions, perennial leeks and garlic, gives us some form of those vegetables although we still have to buy our brown and red onions. The outside of the bush house - yes, it needs to be tidied up. I was asked last week what our bush house is. Well, it's just a shade cloth covered structure, located in the backyard, near the water tank, where I sow seeds in trays, propagate plants, store potting soil, keep the worm farm, and generally protect young and emerging plants from the harsher conditions outside. Inside the bush house is always cooler in summer, and if I keep the water up to it, provides a cool and humid place for ferns, orchids, sick or baby plants and seedlings. I guess it's the tropical equivalent of a glasshouse - it provides protection from sun, heavy rain, wind, birds and wandering insects. 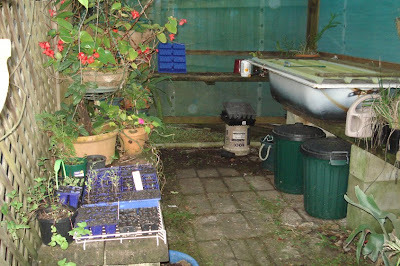 Inside the bush house (ditto on the tidying up), the potting mix bins sit under the worm farm (bathtub), seedlings on the left and assorted plants sit on the shelves. It's early Sunday morning now and I know we'll have a lovely day today because Shane and Sarndra are coming over for lunch. 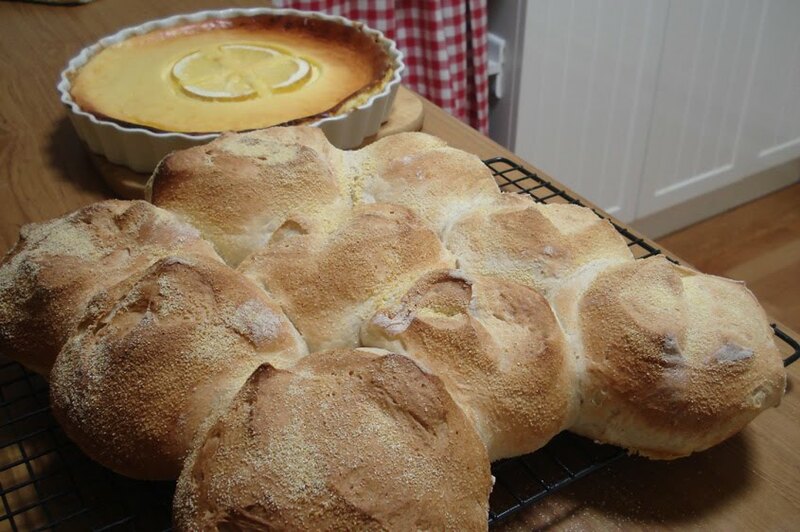 I've already made a mountain of little meatballs that I'll add to homemade tomato sauce, I'll pick a salad from the garden, bake bread rolls and, depending on whether there is an egg or two later this morning, make a lemon tart for dessert. I'll sow the celeriac seeds before they arrive and then we can all relax and enjoy the afternoon, knowing that all our work has been done and those little seeds are slowly making their way through the soil into the sunlight. 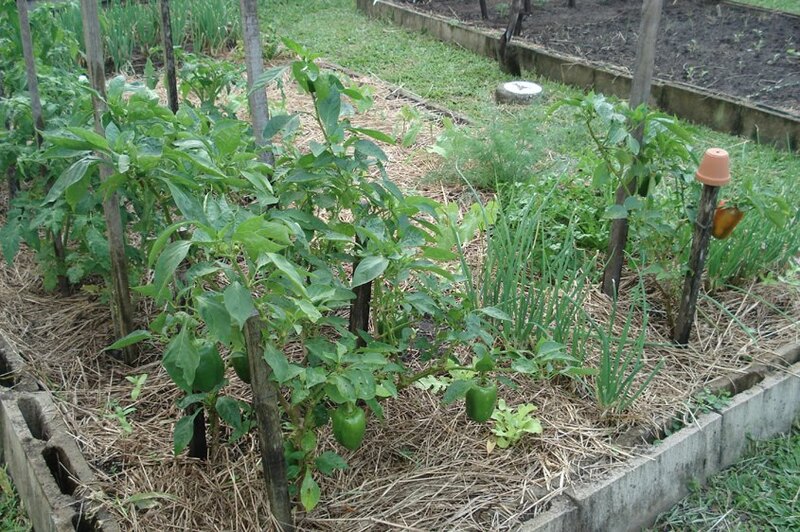 Newly sown seeds, seedlings and propagated herbs sit at the sunny end of the bush house. They get the gentle morning sun for about two hours to warm the soil, then sit in shade all day. 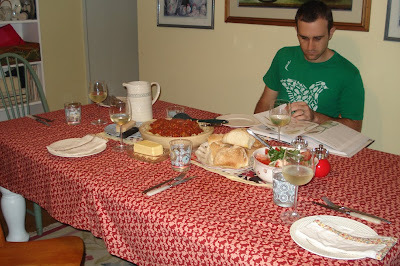 All this week's roads have been leading to this lunch; a time to sit back and enjoy life with my family. Even though most of our days are similar now, made different only by the days I go to my voluntary work, there is still something special about Sunday afternoons - they seem to be made for experiencing, first-hand, the comfort of one's home, socialising, connecting and being with family and friends. These are the days that memories are made of. If you're after some weekend reading, go no further than this list at The Long Thread. It's full of charming blogs, thoughtful and fun projects and many things to keep you interested. Today's kitchen is Libby's in Woolongong Australia. Woolongong is just south of Sydney. 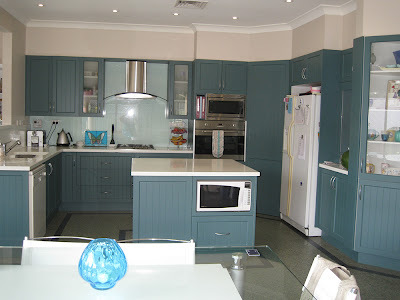 "I love my kitchen - I designed it myself (I used to work as a Kitchen Designer) so everything is just how I wanted it. My sink looks into our family room and out to the vegetable garden. And the main orientation from the kitchen, when I'm preparing food, is outside. We've been in this home for over 4 years now and my kitchen still makes me so very happy." 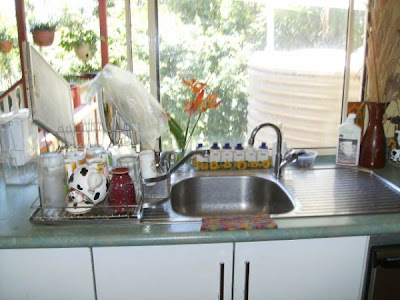 PLEASE NOTE: I am not accepting any more kitchen sink photos. After I have gone through those I still have, I'll start another pictorial type of post that you can be involved in. There are certain times during the year when the air temperature is so mild and gentle we seem to blend into the natural environment and become part of it. It was like that yesterday. 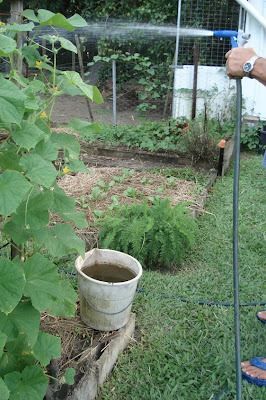 Late in the afternoon, as I was making dinner, I noticed Hanno was outside planting and watering. I grabbed my camera and went out to join him. There was no breeze, the air was neither cool nor warm, the conditions were perfect. Just a few short weeks ago, our garden was almost bare. 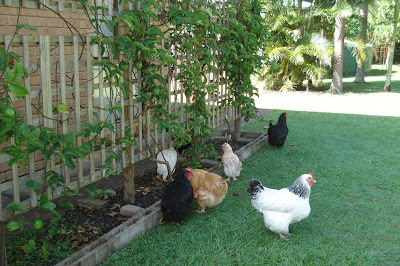 We stopped planting in November and have scratched a few harvests since then, but the main activity in the garden has been when we let the chook loose in there to scratch around for insect eggs and eat all the grubs and caterpillars. 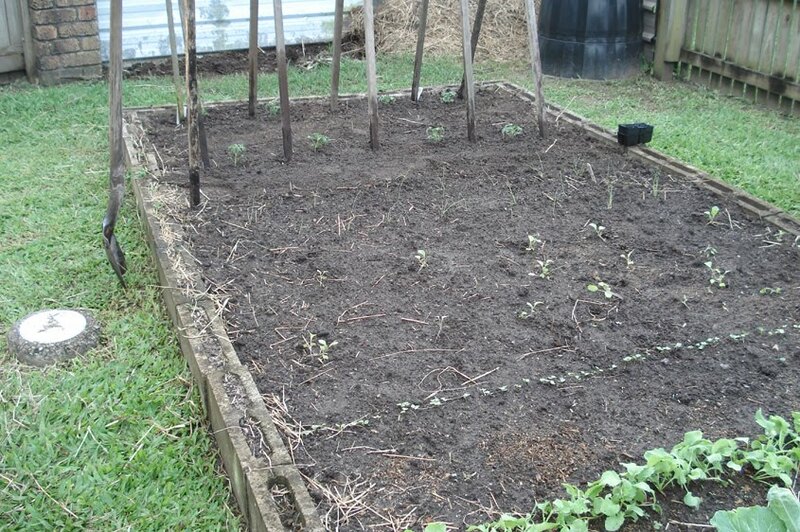 After that, Hanno built the soil up again with cow manure, compost, old chook manure and worm castings. 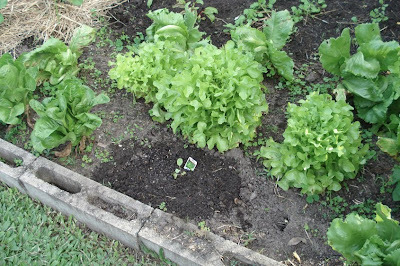 When he planted the first lettuces and cucumbers in the garden a few weeks ago, they burst into life and have been feeding us for the last week or so. 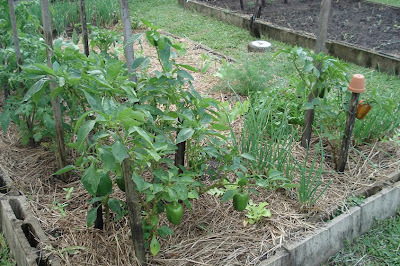 There is nothing better than the taste of fresh vegetables and nothing gives me a greater feeling of self reliance and confidence than walking outside in the afternoon to collect food for our dinner. It's sublime on every level. While I was outside yesterday afternoon, I took these photos. They speak for themselves, so I'll let them tell their own story. My thanks to Hanno for providing us with such healthy, sustainable, organic food. Welsh onions and lettuce. Click on photos to enlarge them. 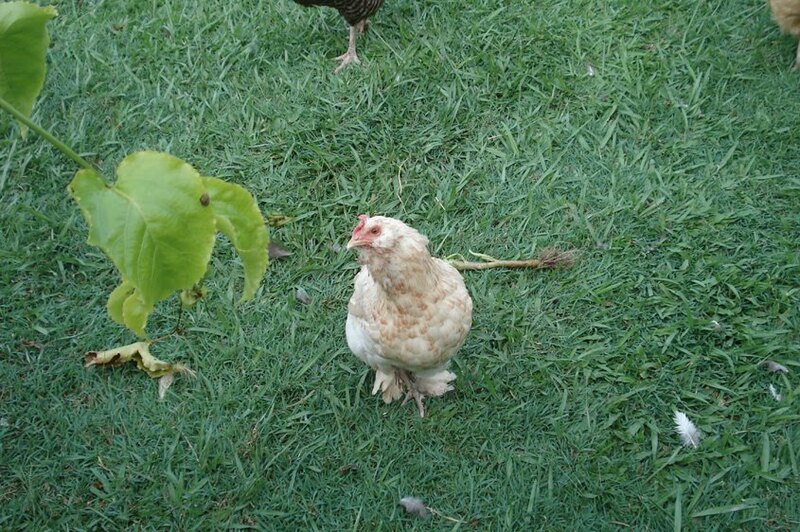 Just on the other side of the fence, Heather, our salmon Faverolles chook, waits, hoping for a lettuce leaf. From the bottom end, unseen potatoes, beetroot, lettuce rocket/arugula and cucumbers. Lots of capsicums/peppers, dill, parsley and green onions. 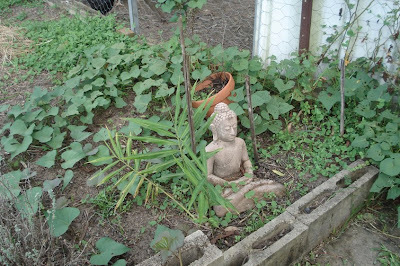 Sweet potato madly growing everywhere and some ginger nextto the girl Buddha. 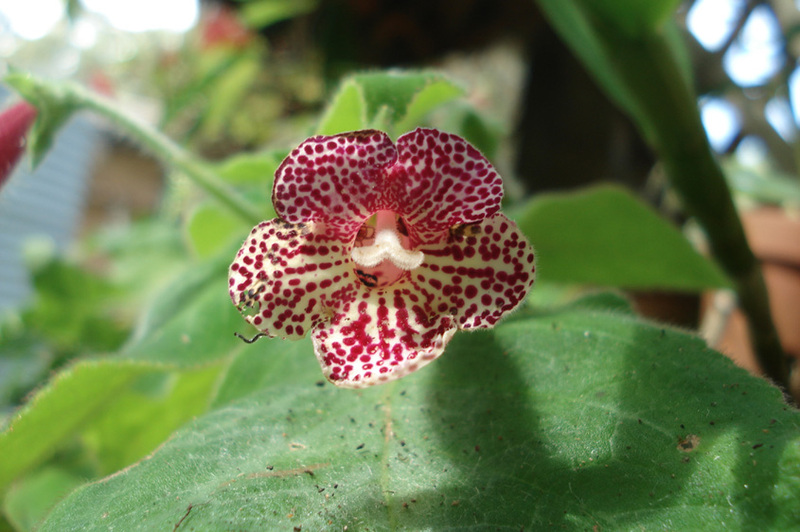 Whenever something is harvested, a new plant takes its place. 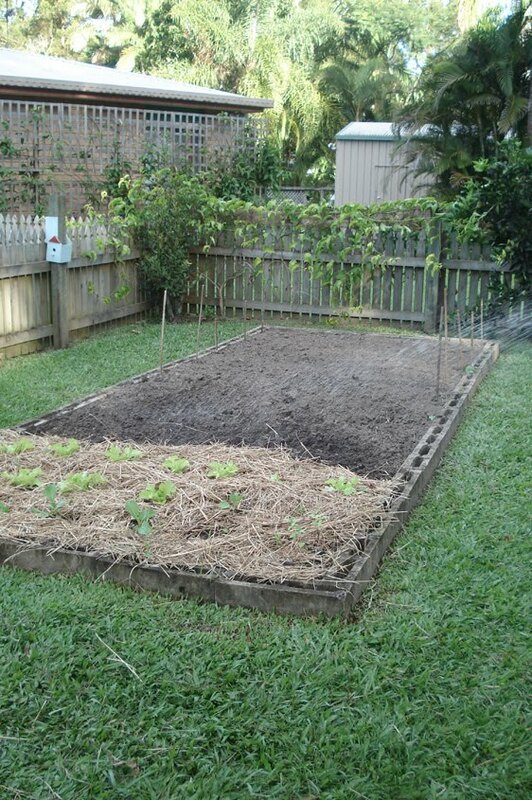 Keeping up with succession planting is the most difficult part of this kind of vegetable production. 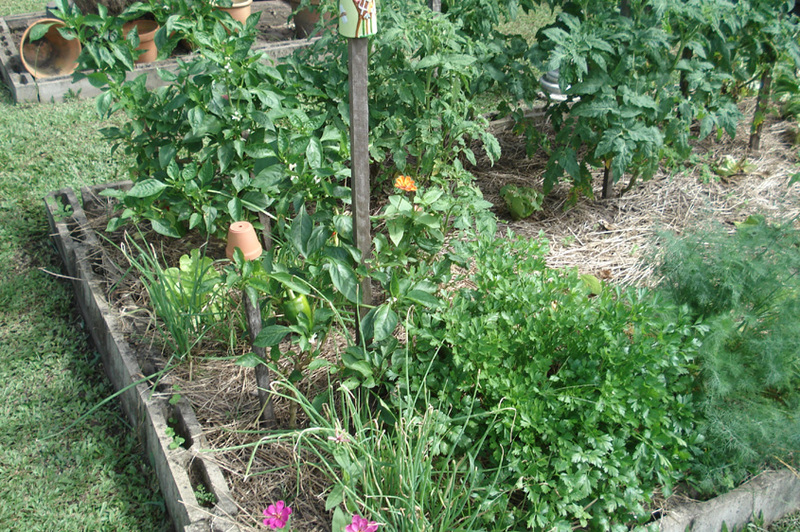 Tomatoes have been planted at the base of each post in this A frame. 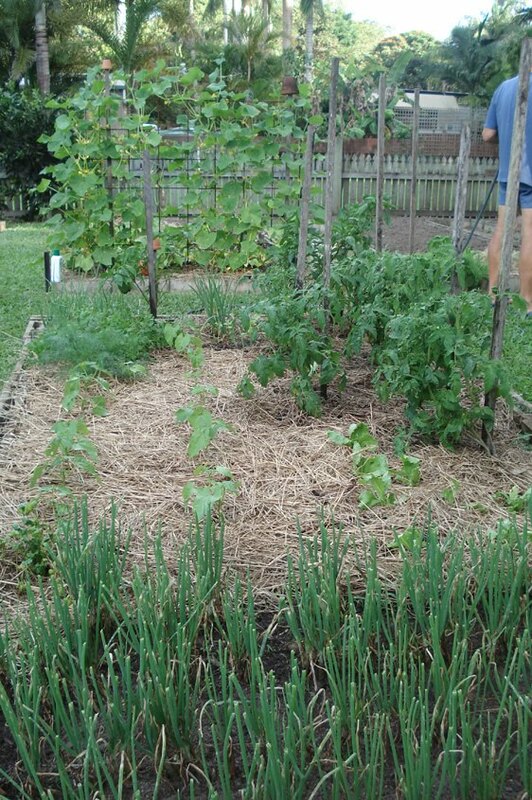 Next to them are leeks and radishes. 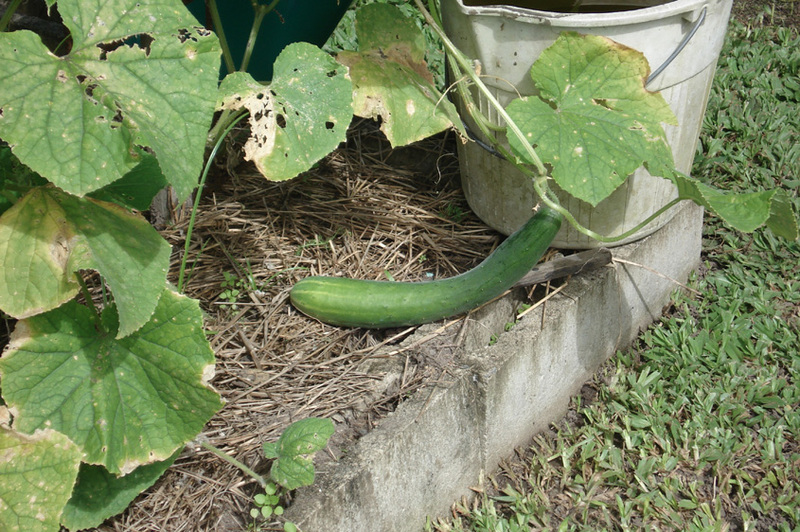 There is an abundance of cucumbers. Tools of the trade always at hand, a trowel for digging planting holes, an old grapefruit knife for removing seedlings from their punnets and a bucket of seaweed tea to help with transplant shock. 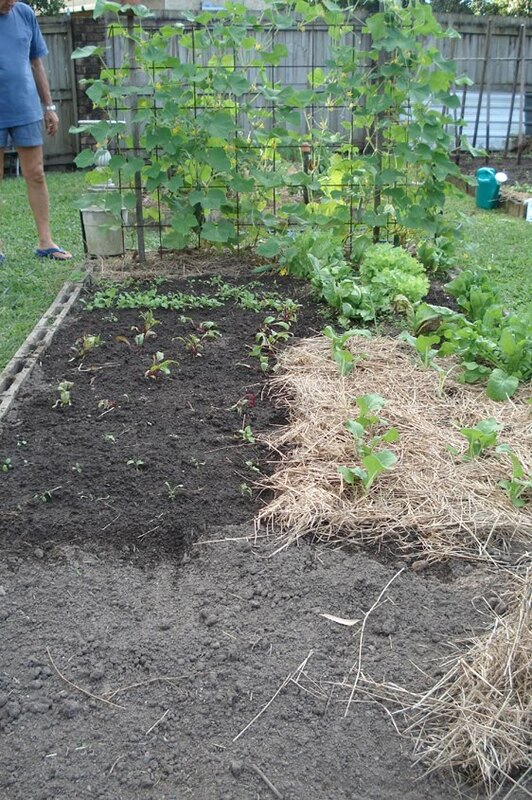 From this end, radishes, parsnips, sugarloaf cabbages, leeks and tomatoes. 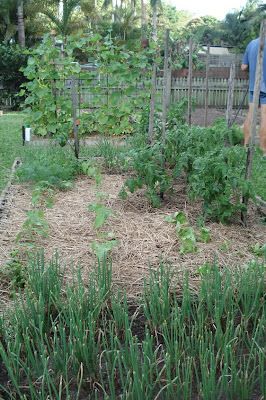 Welsh onion, green beans, coriander, tomatoes, parsley, dill, capsicums/peppers and zinnias. 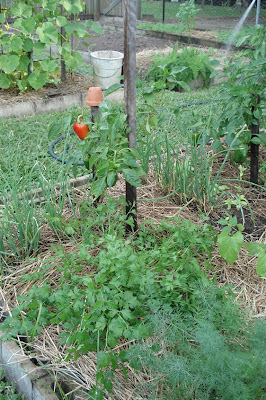 Capsicums/peppers, parsley, dill, green beans and Welsh onions. 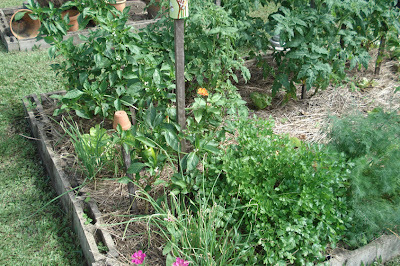 Cucumbers (left), yarrow (for herb tea), bok choi, sweet potato. Yellow passionfruit. 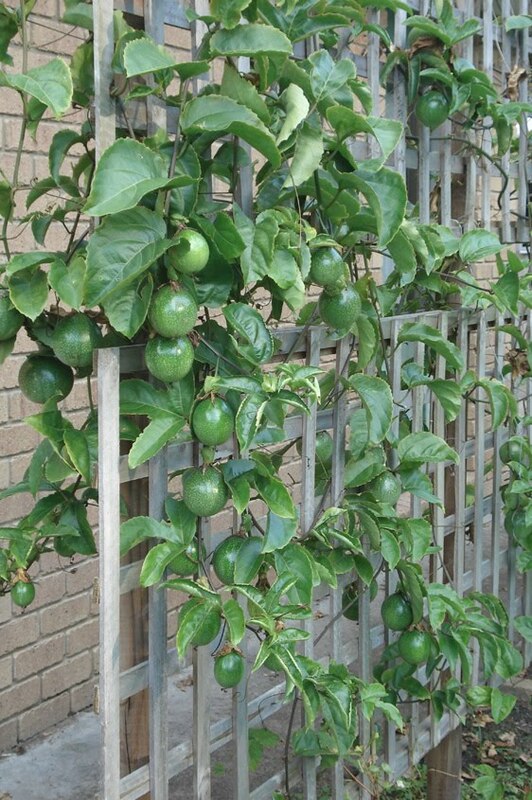 There are black passionfruit at the other end of the trellis. And to answer the most asked question on the blog, the upturned pots are to stop us taking an eye out on the stakes and bamboo canes, and they're also decorative - I like the look of them.